When I would visit my aunt and uncle in Santa Cruz, one of my favorite places to go was the Boardwalk. 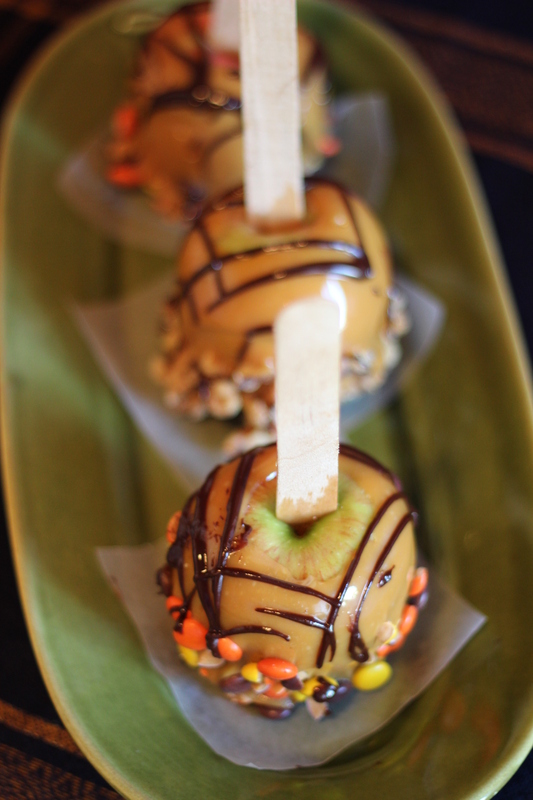 And on the Boardwalk, one of my favorite things to get was a caramel apple. 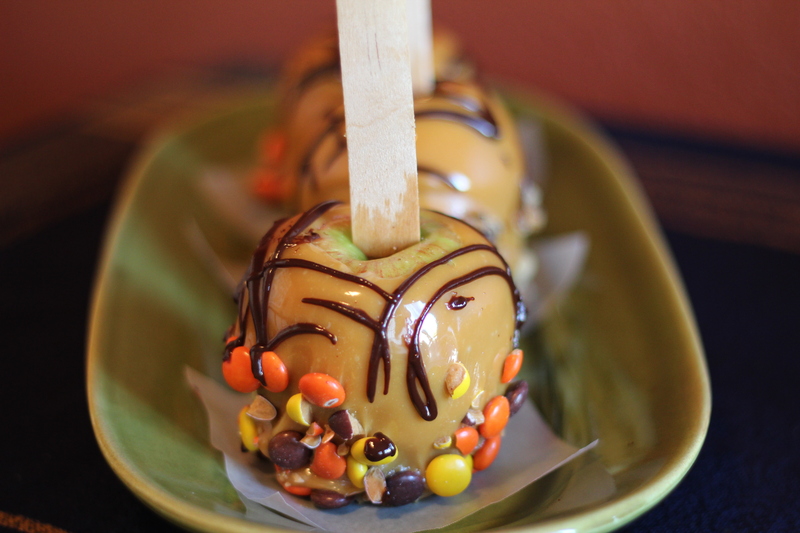 Walking into the shop, my eyes would fixate on the beautiful caramel apples in the display case, beckoning me with their different toppings–M&Ms, chopped nuts, white chocolate, dark chocolate. Oh, it was so hard to choose just one! But today…today I didn’t have to choose just one. 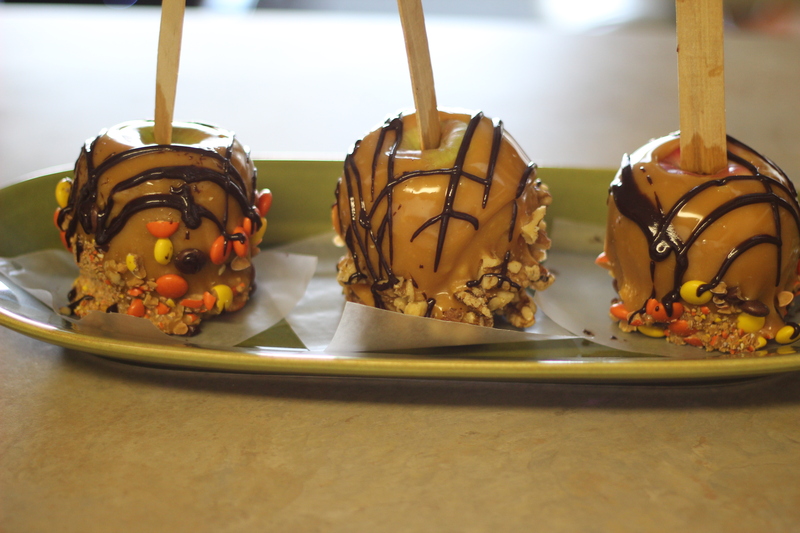 I made my own caramel apples and didn’t have to choose. What a wonderful feeling. However, I didn’t make them just by myself, or just for myself. 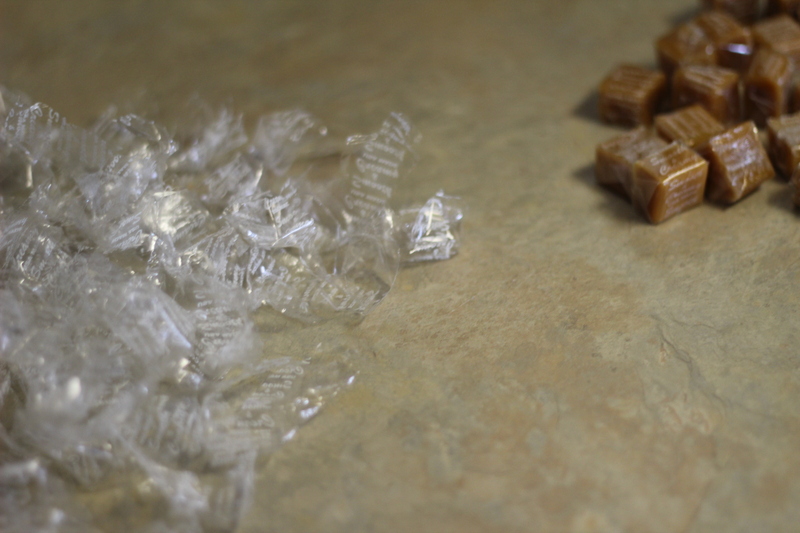 Eric and my mom helped me by peeling the wrappers off the caramel (which was HUGE), and then, once they were hardened, eating them. 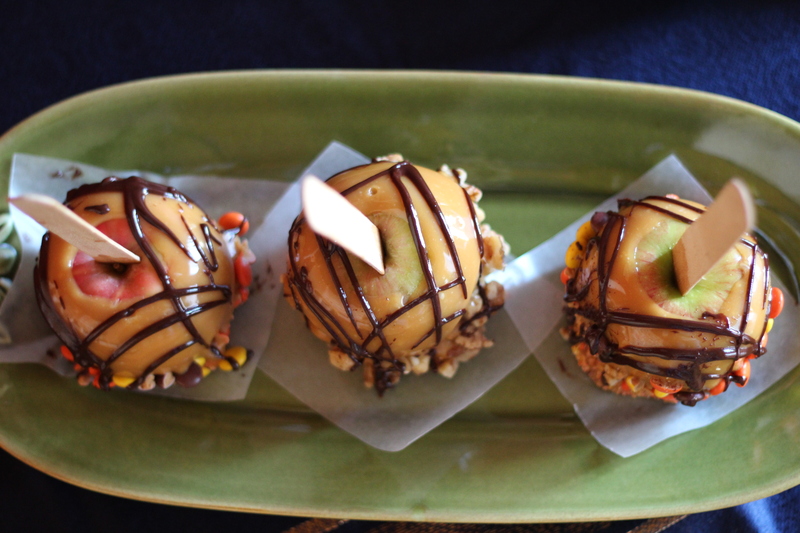 To make caramel apples, you first need to melt the caramel squares–either in the microwave or a double boiler. I am not good with the microwave, so I use the double boiler. 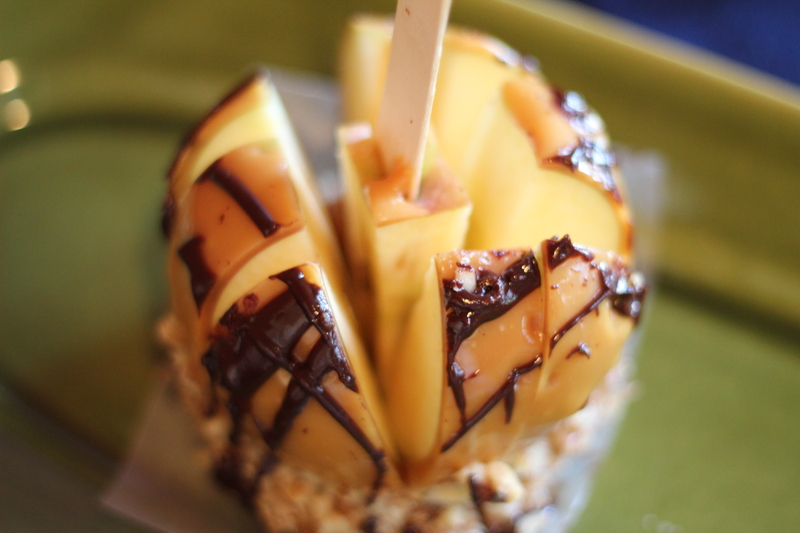 While the caramel is melting, take your popsicle sticks and stick them halfway down into the apples, keeping the stick straight. (What I mean by that is, let the apple naturally lie on the counter–none will be perfect, and many will tilt to the side–and then insert the stick.) 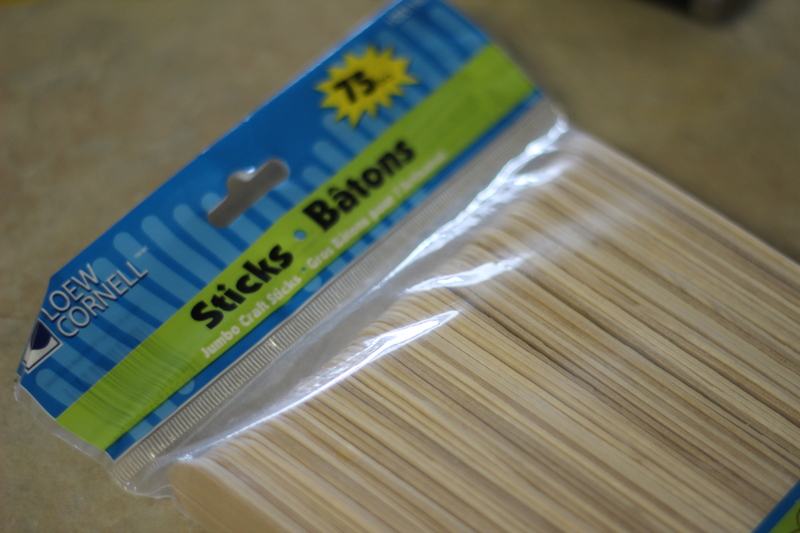 I like the jumbo craft sticks, but you could use whatever suits your fancy. You will also need to chop any toppings, if you are using them. Then, line a cookie sheet with wax paper, so once the apples are coated, they can fully set up in the fridge and not stick to the sheet. 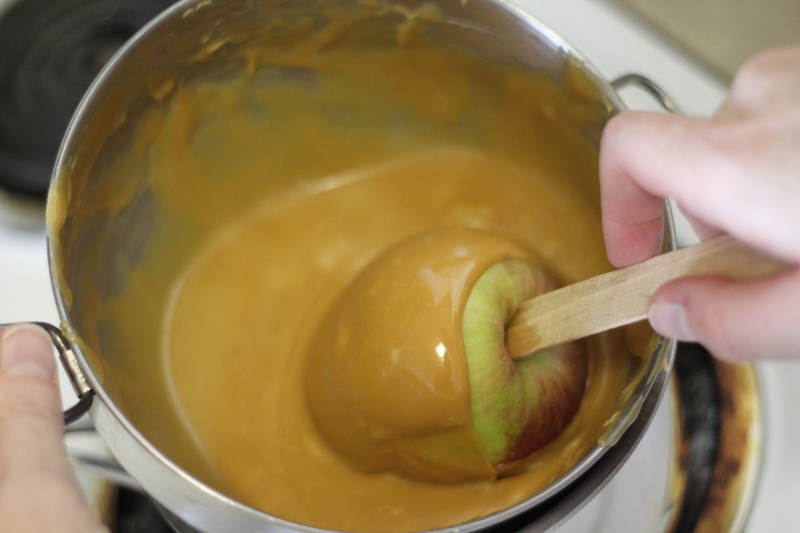 Once the caramel is fully melted and it’s not too thick, dip each apple into the caramel, trying to coat as much of the apple as possible. 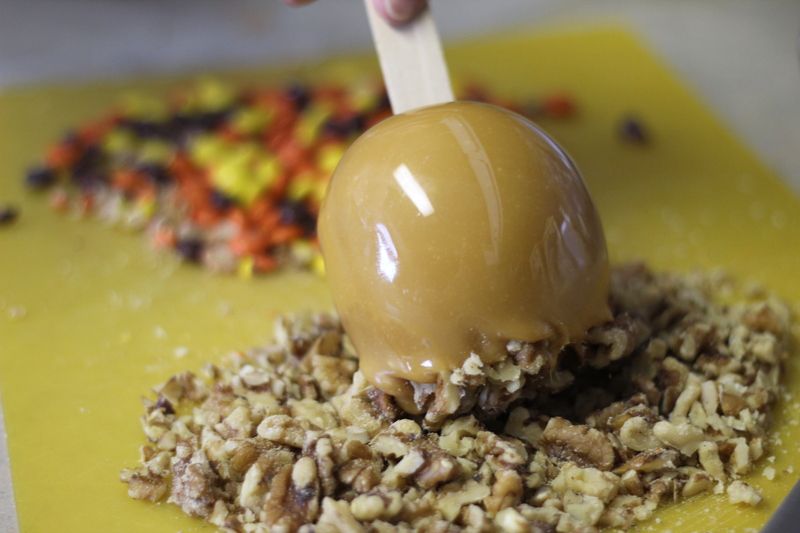 Lift the apple out of the caramel and let the excess drip off before transferring to the wax paper. 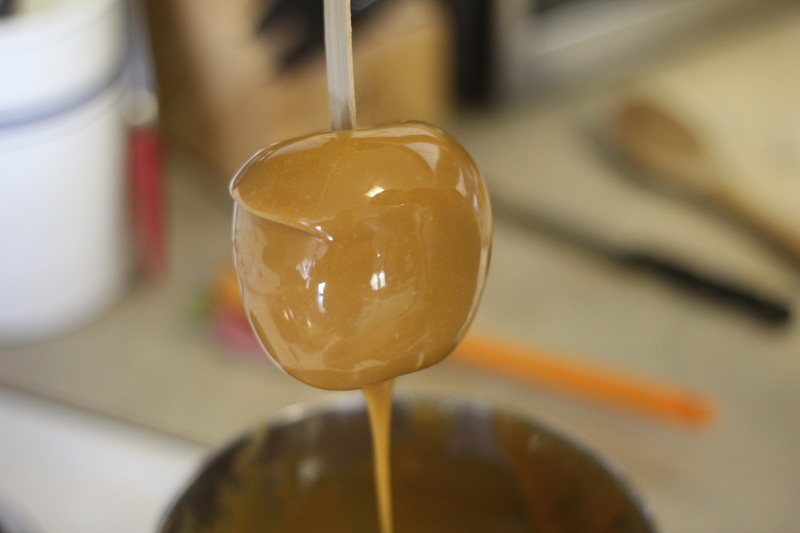 If you are using any toppings, press them into the caramel (if you want them on the bottom) or sprinkle on the top. 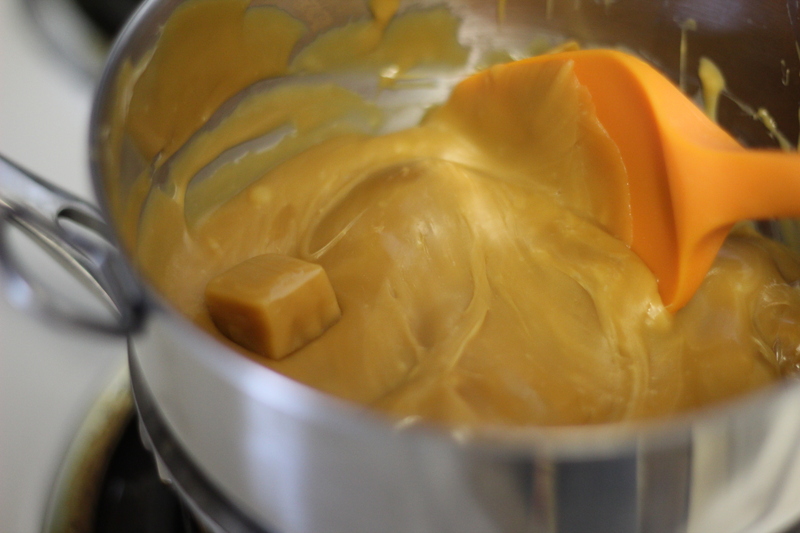 You will have to do this quickly, as the caramel will begin to set. If you want to drizzle with chocolate, melt the chocolate in either the microwave or a double boiler. (I add whipping cream so that the chocolate isn’t too thick. Add a tablespoon at a time until the desired consistency is reached.) 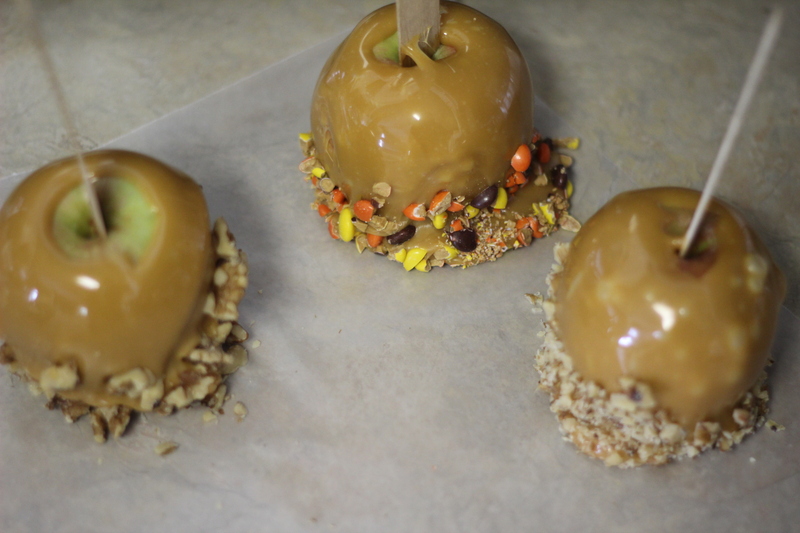 Spoon into a squeeze bottle and drizzle onto the apples. Once you are done coating all the apples, place in the fridge for an hour until they fully set up. The easiest way to serve the apples would be to make four cuts next to the core, two slices horizontally and two slices vertically. They will stay in the fridge for up to two days. 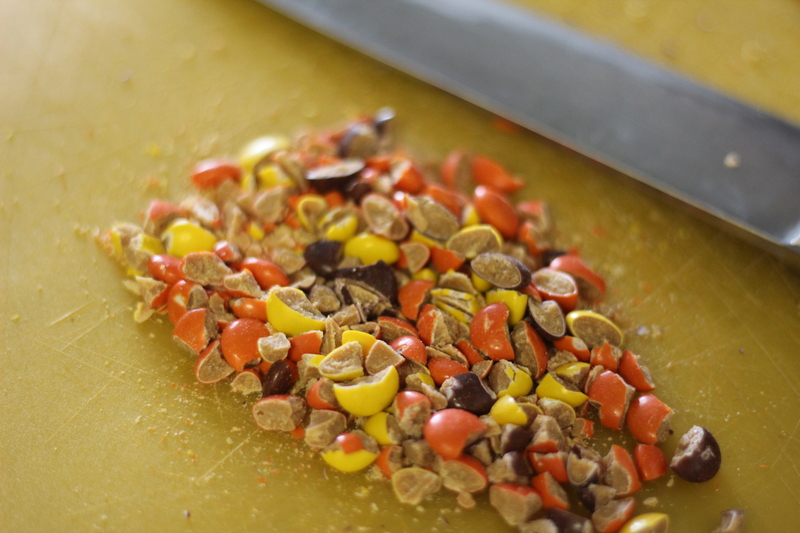 toppings–melted white or semi-sweet chocolate, chopped nuts, chopped M&Ms, chopped Reece’s Pieces, etc. 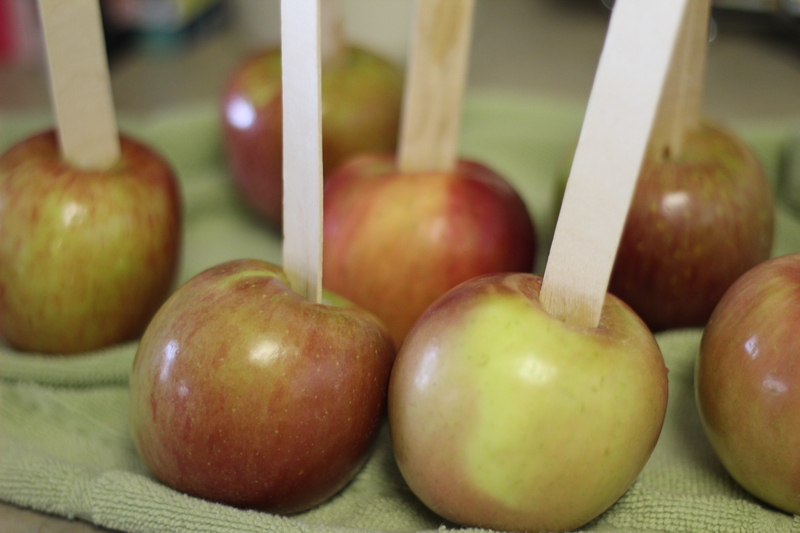 While the caramel is melting, take your popsicle sticks and insert them halfway down into the apples, keeping the stick straight. You will also need to chop any toppings, if you are using them. If you want to drizzle with chocolate, melt the chocolate in either the microwave or a double boiler. (I add whipping cream so that the chocolate isn’t too thick. Add a tablespoon at a time until the desired consistency is reached.) 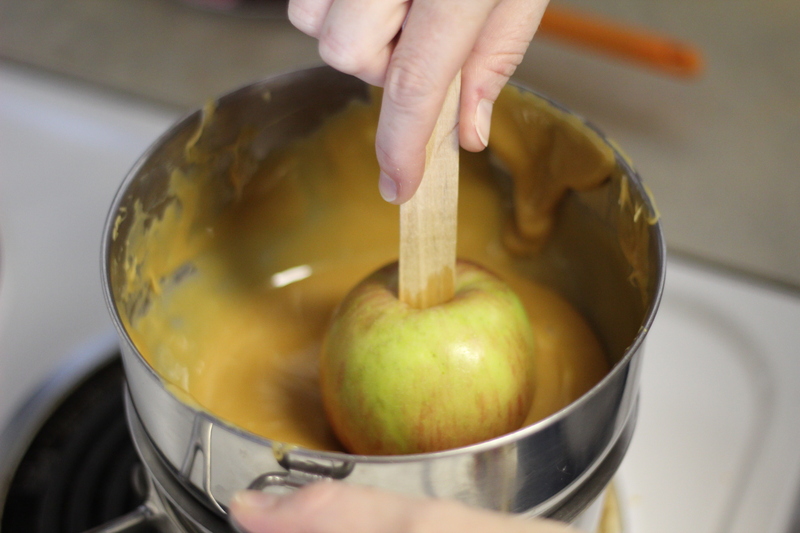 Spoon into a squeeze bottle and then drizzle over the apples. Once you are done coating all the apples, place in the fridge for an hour until they fully set up. The easiest way to serve the apples would be to make four cuts next to the core, two slices horizontally and two slices vertically. They will stay in the fridge for up to two days. So pretty! Way to go!